Matt Andersen – All Fired Up & On the Road! 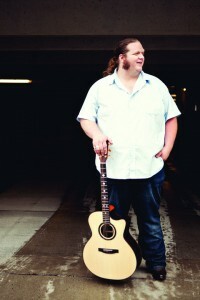 Matt Andersen, the acclaimed singer-songwriter and guitarist, is having the busiest year of his career. So far it’s included a six-day blues cruise around the Caribbean, two shows at Britain’s massive Glastonbury Festival, and 14 major Canadian folk, jazz or blues festivals. He played nearly 100 other shows from the Maritimes to Vancouver Island, and two tours supporting the CBC’s Stuart McLean’s Vinyl Café concerts. Matt began to build his name on the Canadian circuit, his imposing voice and slashing slide guitar making a monolithic impression on audiences. Performing more than 200 shows a year, Matt won the Maple Blues Awards for Entertainer of the Year and Acoustic Act of the Year and was nominated for four East Coast Music Association awards. In 2010 he became the first Canadian to win Memphis’s famed International Blues Challenge, which led to festival dates in France, Italy, and the US, where he toured with Old Crow Medicine Show. He debuted with 2002’s One Size Never Fits, and followed with the equally warmly-received Solo at Session (2004) and Live at Liberty House (2005). Andersen’s career is expected to move upward with the release of his latest CD, Coal Mining Blues, which was produced by Colin Linden (who co-wrote and plays on several tunes) and recorded at Levon Helm Studios in Woodstock, New York. Featuring The Band’s keyboardist Garth Hudson and Olabelle singer Amy Helm, it’s a rich vein of new songs, much of the material addressing the difficult lives of working people.